Das neue Frankfurt was an affordable public housing program started in 1925 and completed in 1930. It was also the name of the accompanying monthly magazine that was published in 55 numbers from 1926 to 1931 dedicated to international tendencies in architecture, the renewal of art, housing and education. It was edited by Ernst May and published by Englert und Schlosser, Frankfurt am Main. Its subtitle changed through the years: Monatsschrift für die Fragen der Grosstadtgestaltung (1926-27), Monatsschrift für die Probleme moderner Gestaltung (1928-29), and Internationale Monatsschrift für die Probleme kultureller Neugestaltung (1930-31). 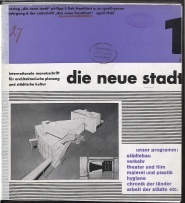 Starting with the April 1932 issue it was renamed to Die neue Stadt: internationale Monatsschrift für architektonische Planung und städtische Kultur and edited by Joseph Gantner. Die neue Stadt was published in 13 numbers between April 1932 and June 1933 by Philipp L. Fink, Frankfurt am Main. The contributors included Walter Gropius, Sigfried Giedion and many others. 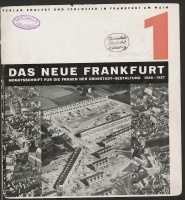 Das neue Frankfurt 1 (Oct/Nov 1926). Die neue Stadt 1 (Apr 1932). This page was last modified on 8 September 2014, at 16:27.